DALTON , GEORGIA – It was another banner year for the SPA ORGANIZATION in 2014 as the SPA WORLDS ATTENDANCE hit a new high with 166 teams attending. The increase in the WORLDS attendance kept pace with SPA'S overall growth for 2014. In the mid-west and east alone, SPA averaged over 40 teams per tournament drawing over 800 teams for the twenty tournaments in that region. Overall SPA crowned in the 80, 75 GOLD, 75 SILVER, 75 MAJOR, 70 AAA, 70 AA, 70 MAJOR, 65 AAA, 65 AA, 65 MAJOR, 65 MAJOR PLUS, 60 AAA, 60 AA, 60 MAJOR, 60 MAJOR PLUS, 55 AAA, 55 MAJOR, 50 AAA, 50 MAJOR and 50 MAJOR PLUS. POOL AND BRACKET PLAY SCORES MAY BE FOUND ON THE SPA RESULTS PAGE AND ALSO FRONT PAGE. DALTON, GEORGIA – TEAM ELITE CC MIKEN got their money's worth at the SPA WORLD CHAMPIONSHIPS at DALTON, GEORGIA'S HERITAGE POINT PARK, using three pool games and six bracket games to win the SPA 2014 50 AAA TITLE. The MARYLAND team went 2-1 in pool play and 5-1 in bracket play, winning their last three loser-goes-home games to win the championship. Where other teams have names like BOB, BILL, JOHN, etc, TEAM ELITE'S roster was sprinkled with names such as HILLBILLY, POPS, J HOLLYWOOD, BUZZ, 50/50, RAZ and RINGO. And they all were versatile and played different positions from one game to the next. They needed the versatility because only twelve players made the 11-hour trip to DALTON. All 12 played in the pool games but only 11 were used in each of the bracket games with one player being kept in reserve in case of injury. After falling in the pool opener to the DAYTON HITMEN 17-12, they ran off four wins in a row beating STILL SWINGING (20-15) and NORTH GEORGIA OUTLAWS (23-15) in pool play and then SOUTHERN HURRICANES (29-23) and FINANCIAL EAGLES (15-11) in bracket playing before losing again. From there on things changed for the better. What changed them? The session worked as TEAM ELITE opened SUNDAY beating FINANCIAL EAGLE 20-15 then forcing an “IF” game with a 26-17 victory over DAYTON and followed that with a 21-14 decision against DAYTON in the title game. Earning MVP TOURNAMENT honors was SAM MANNS. The first baseman hit .861, including nine HR'S and 38 RBI'S. In addition he was involved in several key defensive double plays. It hasn't been an easy first year for TEAM ELITE despite winning the 50 AAA SPA WORLDS. Injuries have been common, just notice the “DNP'S” on the above roster. Besides all the sponsor names listed as TEAM ELITE CC MIKEN, the team is self sponsored except for some help from teammate CLIFF CURTAIN, who has a trucking company in CATONSVILLE, MARYLAND and HARDESTY HEATING AND AIR CONDITIOING plus a few other anonymous sponsors. GALLAGHER and JONES both had high praise for RIDGE HOOKS and the SPA WORLDS. 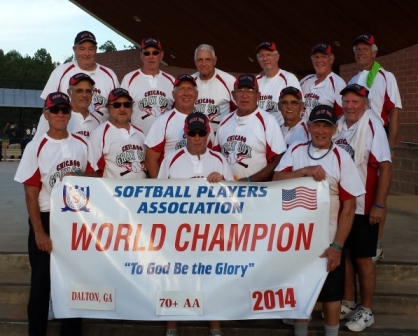 DALTON, GEORGIA - The CHICAGO GRAY SOX made their first appearance as a 70's team in the SPA WORLDS a memorable one by winning the 70 AA TITLE at DALTON, GEORGIA'S HERITAGE POINT PARK SEPTEMBER 4-7. The GRAY SOX, who still have eleven players (CHARLIE BYRUM, RICHIE DOUGLAS, JACK FELVER, FOSTER, GARY HEIFNER, ROY IVERSON, KENNY KIRK, ROGER LENART, WAYNE MARKETT, JERRY SANTERELLI and GARY STONE) from the original 2003 team, had to really work to win the championship. They started out fine winning both pool games against LEIDEN'S LEGENDS (24-10), DAYTON LEGENDS (20-16), and their first bracket game 11-4 against LEIDEN’S again. But an 18-12 loss to DAYTON in the second round ushered the GRAY SOX into the dreaded losers' bracket. After catching their second wind, The GRAY SOX knocked off the INDIANAPOLIS CLASSICS (13-10) and then forced an “IF” game with DAYTON by escaping with a 10-9 win. “That was a close one,” FOSTER said. “Our defense was the difference. ” The GRAY SOX had everything working in the title game beating the OHIO team 20-11 for the championship. FOSTER said the biggest key to them winning the tournament was the entire roster. One player, who did not rotate much was tournament MVP JIM DUCHARME, who led the team in hitting. Joining DUCHARME on the ALL-AMERICAN team were DOUGLAS, IVERSON, STONE, JACK ZUZAK and JIM MANNING. Others on the team are: EDDIE ACCOMANDO, ROGER LENART, JACK WATKINS, EDDIE DUNN and JIM HANDLEY. KIRK Received the SPA 70 AA MANAGE-OF-THE-YEAR AWARD. KIRK, who has been the third base coach and assistant manager all year, ran the team in DALTON.
. “The wives have been a great support group to us at all of our tournaments and we really appreciate them,” FOSTER said. Even though the team is self sponsored, they do attend a lot of tournaments.